Today I think I will talk about some of the important symbols in the Bahá’í faith. 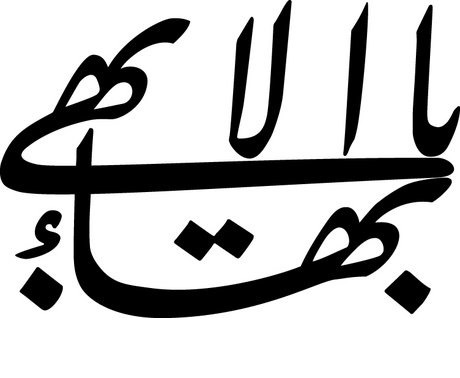 The symbols of my faith are derived from the word Bahá’ (بهاء) which in Arabic means splendour or glory. Bahá has the numerical value of 9, and so the most common symbol of the Bahá’í faith is a nine-pointed star. 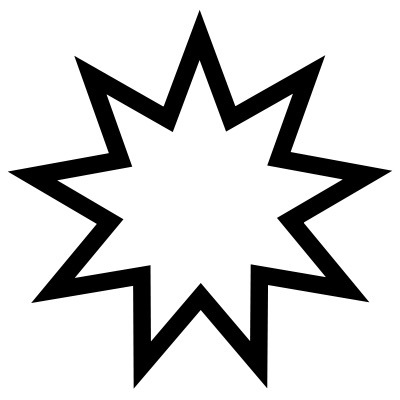 We also use another star as a symbol of our religion, the five pointed star known as the haykal, and this was originally used by The Báb to describe the coming of Bahá’u’lláh, with the points of the star representing his head, arms and legs. One of the most common symbols of our faith that you will see is The Greatest Name. Islamic tradition holds that God has 99 names, and the 100th is hidden and is the greatest of his names. We Bahá’ís believe this name to be Bahá, and from this is derived the phrase Yá Bahá’u’l-Abhá, which means “O Thou the Glory of the Most Glorious”. This phrase was rendered in calligraphy by Mírzá Ḥusayn-i-Isfahání and was later adopted by the wider Bahá’í community as a symbol of our faith and it’s a symbol that is rather common in our faith, but at the same time held in great reverence as it directly refers to the name and messenger of God. 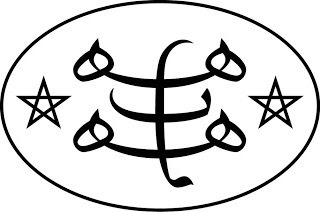 The last symbol I will mention is the ringstone symbol which was designed by `Abdu’l Bahá, the son of Bahá’u’lláh. It consists of two five pointed stars with a stylised Bahá between them, in which the lower line represents humanity, the middle the manifestation of God and the upper the word of God, the vertical line connecting them all represents the the Holy Spirit proceeding from the word of God to humanity via the manifestation. And the two stars represent Bahá’u’lláh and the Báb. As it’s name implies it’s most commonly found on rings worn by members of the faith, but I have seen it on other jewellery as well. And those are the major symbols of my faith, I hope that you found today’s post informative.